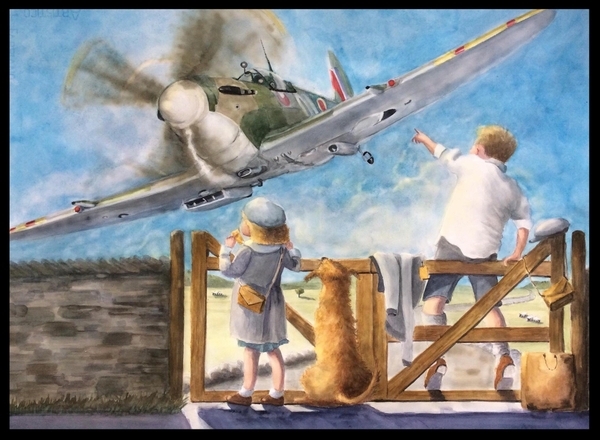 Beautifully framed in archival materials, this lovely painting depicts two child evacuees, in the British countryside, watching one of their heroes performing a low pass in a Spitfire. One of the most, if not the most, emotionally wrenching decisions made by the British government during World War II was its decision to relocate its children out of urban centers to locations where the risk of bombing attacks was low or non-existent. Almost 3 million people were evacuated during the first four days of the operation, making it the biggest and most concentrated population movement in British history. One mother in London, after watching her own two children march off, saw two tots leave a line and rush up to a policemen standing in the middle of the intersection, holding traffic until the children had passed. “Bye-bye, Daddy,” they said. The policeman looked down, smiled, and said, “Now be good, kiddies.” The children then got back in line. As they did so, the mother saw tears rolling down the policeman’s cheeks.